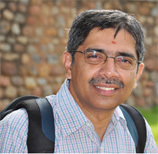 Raman Rajagopal is an Associate Professor in the Department of Zoology, University of Delhi, Delhi and is working on Gut Microbiology, Vector Biology, Xenobiotic degradation. 4. Selected for the MR4 International bioinformatics workshop on Malaria Vectors 2003, (sponsored by NIAID, NIH, USA), at John’s Hopkins University, Baltimore, Maryland. 5. Scopus Young Scientist Award, 2008.